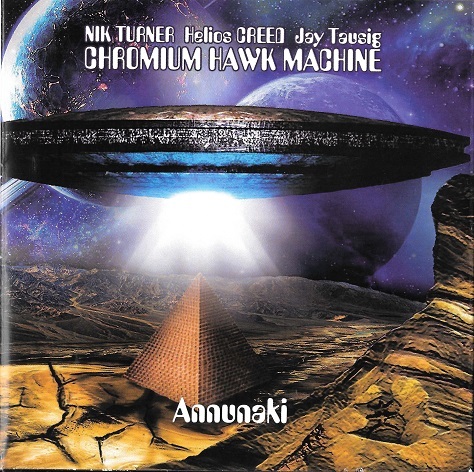 Tripped out acid space jams here with Nik Turner & Helios Creed reuniting after 24 years. Helios' ripping fuzzed-out riffs and lysergic leads throughout and some vocals, Nik Turner's warped sax and vocals, and last but not least Jay Tausig on drums, bass and responsible for all the spacey synth sounds throughout. "Time And Terraforming" is one of the highlights on this. As was the case with Helios joining Nik on his Space Ritual '94 tour, Helios's guitar with it's killer fuzz tones and acidic leads just adds a whole other dimension & intensity to Nik's music. In other words, a collaboration between the two is always welcome!